See the remains of the industrial revolution of the 1800's with the Old Cotton Mills and large warehouses that dwarf the Canal. The Blackburn skyline once had 200 chimneys, one of 95m being almost the highest in the UK, but many have now been demolished. Hoghton Tower, a Grade I listed building ia an ancient, fortified, hilltop manor house occupying a commanding position, with magnificent views of Lancashire, the Lake District and North Wales. James I famously devoured a delicious joint of beef here and knighted it 'Sir Loin' and it has been known as Sirloin Steak ever since, so next time you see it on the pub's menu you can remember where the name came from ! In the distance on a clear day you can see the summit of Pendle Hill (1831 ft high), this is an attractive part of the canal unspoilt by industry , with ever-changing views. The suburbs of Burnley are soon reached and from Finsley Gate bridge the Burnley embankment known as the 'Straight Mile” carries the canal 60 feet above the town, and was built around 1796-1801, and remains an impressive construction today and is widely regarded as one of the 'seven wonders' of the British Waterways system. Burnley is 10 minutes walk from Finsley Gate bridge. The area astride the Leeds-Liverpool canal is known as the Weavers Triangle, and between Bridges 129b and 130b is one of the best preserved 19th century industrial districts in the country- there are weaving sheds, engine houses, spinning mills and well preserved terraces of 19th Century cottages- including Slater Terrace, an unusual row of 11 houses above the canal. Next to the Visitor centre, there is a pub The Inn on the Wharf. Oak Mount Mill Engine House is only open on certain days throughout the year. The Queen Street Mill Textile Museum has the last surviving 19th century steam powered mill- you can see the magnificent steam engine driving over 300 looms in the Weaving shed, Open Tues-Fri 12-5 and Sat from 1 May to 30 Sep. There are quite a few pubs in the town. Cobbled streets of terraced houses run down to the Canal, and old Wharves are gradually being restored. There is a nearby shop just after you reach Calder aqueduct. Gannow Tunnel is 559 yds long. This is an attractive stretch of canal, unspolit by industry and with ever changing views, although for a while you will have to contend with the close by motorway . 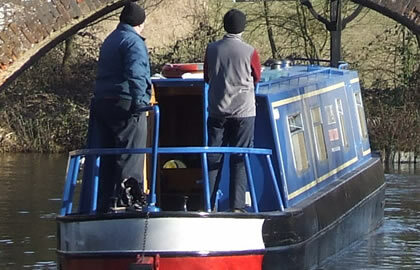 There are moorings at Hapton by Bridge 121 with nearby pubs and local shops. Moor here as it is 2 hours from Reedley Marina unless you stopped at Burnley. The canal is very twisting and winding, athough with no locks you make good progress. You pass the village of Clayton-Le-Moors , with the excellent pub the Albion besides bridge 114a with moorings. There are shops and takeaways nearby. The clay in the name was taken from the clay bricks made around here, and the rough ground is the legacy of clay removal for brick making. The village was the home of Dr Lovelace's soap factory which made floating soap! The Moorfield Colliery has long since closed, but in 1883 was the scene of an undeground explosion that killed 69 miners. Eric Morecome the comedian worked in the pit as a Bevin Boy during the 2nd world war. The village of Church is typical of this area with rows of terrraced houses, and which grew with the Cotton industry and the Mills the canal skirts the grand old warehouses which still remain. Sir Robert Peel's family established calico printing the the community in the 1800's. Moor after bridge 113. The Thorn Mill pub is east of bridge 112. Look out for the so called Fairy caves- secluded ancient monuments connected to the former Aspen Coke ovens all that remains of the coal industry here. This was once an important coal-mining area, but the mines have all gone. The adjacent community of Oswaldtwistle was probably named after King Oswald in the 7th century. It has been an industrial area for over 2 centuries and inventions include the Spinning jenny in 1764 and Terylene in 1941. The canal heads south before changing direction completely and heading north towards Rishton. Rishton grew up around the Cotton Mills of the 19th century in the Industrial Revolution, this was the first place to weave Calico in 1766. The local lords of the manor are still local landowners and started the Cotton Mills along the Canal . Terraced housing was built to accommodate the Mill workers. Plans are underway to develop the remaining Mills which are currently unused, following the decline of the industry in the 1920's and 1930's . There is a cafe canalside at Bridge 108a. Rishton reservoir is passed off to your left complete with Reed Buntings, Curlews and Bullfinches. There is a small aqueduct at Whitebirk and soon you reach the outskirts of Blackburn which stays with the canal for some time. A the edge of Blackburn a retail park has replaced Whitebirk Power station which was the location for the last regular coal traffic on this section of the canal. At the canopied Eanam Wharf the depot was once the focus of the town's canal activity. There is a pub here appropriately called the Depot, and a Visitor Centre. You can moor here and visit the town centre to stock up on provisions. Notable waterside buildings around here include the Daisyfield Mill, the largest surving Corn Mill in Blackburn which is now occupied by a variety of businesses. Blackburn had bronze age inhabitants, the Romans built a fort here, and it has been a centre for cotton weaving since the 14th Century. Imperial Mill is now a listed building and is one of the few 20th century cotton mills in East lancashire. The cathedral was the 1826 Parish church of St Mary with medieval and contemporary glass. There is a very striking 13ft sculpture in aluminium and iron of 'Christ the Worker'. The Museum and Art Gallery in a Grade II listed building has medieval manuscripts, and local history including early textile machinery like spinning jennys. In the art gallery are over 1200 beautiful Japanese prints. King George's Hall is Blackburn's famous events and entertainment centre hosts hugely popular soul nights, comedy clubs and attracts national and international artists. Thwaites Empire Theatre brings the best range of music, plays, comedy and dance shows to Lancashire. Thwaites Brewery is a regional brewery founded in 1807 by Daniel Thwaites in Blackburn, The firm still operates from its original town centre site, although the original brewery was demolished in 2011, and the majority of its beer business was sold to Marston's in March 2015. Blackburn Ice arena is a large covered ice ring with a cafe. North of Bridge 101 towards the cathedral. Blackburn Rovers Football club are based in Blackburn. The Six Blackburn locks bring the 39km Burley pound to an end . The Novia Scotia Wharf was formerley the stables for the horses who used to tow the canalboats. Gates giving access to the towpath in Blackburn are locked at night, and those providing access to a secure mooring in the town can be opened with a BW handcuff key. For suitable moorings consult the lock-keeper. By Bridge 102 a is the pub called "The Postal Order' By Bridge 99 is the Moorings Pub, Sams Water edge pub by Bridge 96b , the Navigation Inn by bridge 96a. Close to Bridge 95 the suburb of Cherry tree provides a delightful range of shops and takeaways, there is also a useful shop at bridge 94. By Bridge 95 you can walk north to Witton Country park which has 480 acres of woods and grassy areas with good walking trails for the kids and dogs. It is 7 hours to here. Also the Boatyard pub canalside has mooring for customers. Hoghton Tower is past the Royal Oak pub at Bridge 91a , Hoghton Tower, a Grade I listed building, is the ancestral home of the de Hoghton family. The de Hoghtons are descended directly from Harvey de Walter, one of the companions of William the Conqueror, and through the female line from Lady Godiva of Coventry, wife of Leofric, Earl of Mercia. Re-created in 1565 by Thomas Hoghton, this ancient, fortified, hilltop manor house occupies a commanding position, 650ft above sea level. 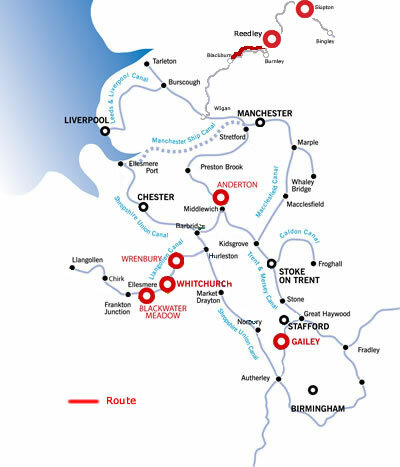 The Tower hasmagnificent views of Lancashire, the Lake District and North Wales. Hoghton Tower is the only true baronial hall in Lancashire. Over the centuries many royal guests have been welcomed and entertained here including James I, William III, George V & Queen Mary, and Prince Philip, Duke of Edinburgh. Other distinguished visitors include William Shakespeare, JMW Turner and Charles Dickens. Sorry, we have no pub guide for this route currently.